As the name states, this pair of binoculars is designed with the woman in mind. Nikon Sport Optics and SHE Outdoor Apparel came together to create a Safari binocular women would love. I have been writing binocular reviews for quite a while now, and thought it was time to write about a binoculars specially made for the ladies. Technically these are the same as the Nikon Monarch ATB binoculars. The one big difference is the way it is styled and the extras it comes with. 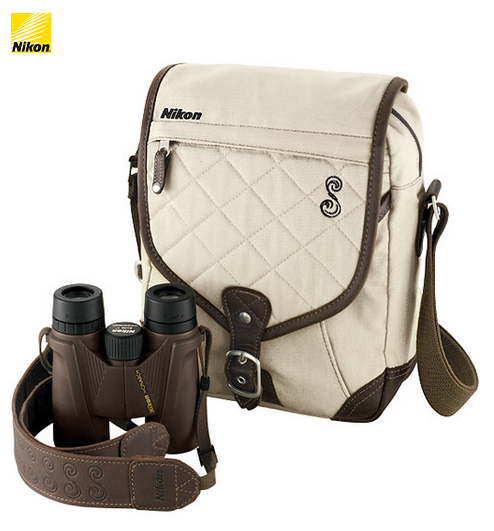 For example, with these binoculars you will get a very stylish carrying bag. Not something you will get with the Nikon Monarch ATB binoculars. There are two main things you want from a pair of Safari binoculars. The Nikon 10×36 SHE Safari Monarch ATB binoculars can do just that. They are light, compact and very tough. But that’s just the exterior. On the inside, it provides you with a very high-quality image. And as we all know, when wildlife is most active the light conditions can be very low. With these binoculars, you don’t have to worry about that. Even in low light conditions you will get a great image.You want them to be compact and you want them to be light. This is because you will be traveling and you don’t want something that is hard to pack or difficult to carry around for long periods of time. You also want the binoculars to be tough and able to withstand the bump and grind that comes along with traveling. The one thing you may notice is the slightly larger objective lenses this pair of binoculars has. Don’t let that throw you off. They are still one of the best pair of binoculars for the outdoors. They use an O-ring seal that makes them completely waterproof. That means you never have to worry about the outside weather conditions ruining your binoculars or the image you see. The O-ring seal protects them from both moisture and dust. This is very important when looking at binoculars to take on a Safari trip. These binoculars have also been purged with nitrogen. What this means is nitrogen gas is now inside the binoculars where air would usually be. By replacing the air with nitrogen gas, the optical surfaces will not fog up. This means you will always have a very clear and vivid image no matter what the weather looks like. As stated before the Nikon 10×36 SHE Safari Monarch ATB binoculars have a larger objective lens. The size of the lens is 36mm. This mid-size lens is perfect for those who love to travel. It’s small enough to fit in your suitcase yet large enough to provide you with the best image possible. Some of the quality components and coatings that come with this pair of binoculars includes Bak 4 prisms, phase correction and a fully multi-coated lens. And don’t worry fellas, if this is too girly for you just go with the Nikon 10×36 Monarch ATB DCF binoculars. Not sure what all these technical terms mean? Check out my handy binocular buying guide here. Now when it comes to price these binoculars are considered very affordable. Especially when you consider the price of other binoculars that are very similar. And while these binoculars are well worth over $500, you can pick these up for under $300.